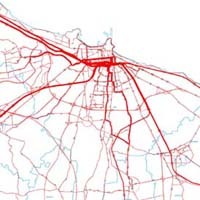 Engineer, Ph.D in Urban System and Civil Network Engineering at the University of Naples Federico II, where is professor of Urban and Mobility Planning. She is also consultant for Bari Municipality in the Research staff for the Strategic Plan of Metropoli Terra di Bari - BA 2015, for the sustainable mobility themes. Engineer, expert in regional and transport planning. He works for the Engineering Company Sintagma srl in Perugia, handling the study and the planning of transport systems at the different scales and with reference to different transport modes. Sintagma worked for Anas, Ferrovie dello Stato, Italferr, Ministero dei Trasporti, construction companies and Local Authorities as Metropoli Terra di Bari for the setting up of the PUM. The Metropolitan Transport Plan of MTB (Metropoli Terra di Bari) is one example of the first practice of large scale plan in Puglia Region. On September 2009, MTB’s Board of Municipalities approved the Metropolitan Transportation Plan for 2015 (PUM MTB), a full plan with text, maps, and figures describing the road, transit and other transportation-related investments planned for the Metropoli Terra di Bari through 2015. According to the Stategic Guidelines of the Puglia Region (2007), the PUM is part of the more complex Strategic Plan process. In fact the PUM and the Strategic Plan (BA2015) are two complementary tools for the transport-land use transformation. The policies provide broad guidance for MTB and agency partners. The Strategies are actions to implement the policies. Some actions can start tomorrow, while others will require years of effort and incremental steps. The purpose of the PUM is to develop an integrated transportation system that advances the guiding principles adopted: – Design a transportation system to support good growth patterns, including increased housing and transportation options; – Minimize direct and indirect transportation impacts on the environment for cleaner air and natural resource protection; – A transportation system that delivers cost-effective results that are feasible to construct and maintain; – Efficiently connect people to jobs and get goods to market; – Improve opportunities for businesses and citizens to easily access goods, jobs, services and housing; – Support the strategic plan vision for the Metropolitan area; The Metropolitan Transport Plan defines a system of interventions that can be articulated in: “network intervenctions” that regard the complexity of the metropolitan area and “singol intervenction” that are phically located into the 31 Municipality that form the Metropoli Terra di Bari. In particolar the intervection cathegories that the PUM defines are: – Prioritize transit investments that result in an effective transit system in order to improve the public transport use; – Renew and improve the road network with preservation of the existing road and highway system; – Intervection for the improve the touristic accessibility of the coast and the main touristic attractions; – Actions for the reduction of trasport impacts on the environment, including the construction of a Metropolitain bycicle network. Developing an effective regional transportation system requires understanding the needs of the region’s residents and the travel choices they will want and need to make. MTB developed this plan with a robust public involvement process including the 31 Municipality transport offices, 7 public transport agencies and many community workshops, where participants had the opportunity to work in diverse table groups in mapping activities to identify their priority investments.